Heron Brook Haven is located on a few acres of beautiful ground in the small town of Pawlet, Vt. We are surrounded by hundreds of acres of farm and family land, which we use for some of our retreats and experiences. The views, spaces and energies that wrap this sacred land are part of its great blessings. When you come here the land and all who are part of it hold you in Sacred Space, a place of timelessness. They are the vessel that embrace and wrap you in their care. Heron Brook Haven is a place where you can escape the reality of the world and reconnect. You can embrace the time and space to connect to yourself, the natural world, your creativity and passion or find the healing and answers you seek. Here you won't find busyness nor will you be surrounded by the latest & greatest or the newest "hashtag". What you will find is a sacred space and beings who support, nurture and guide you. We believe in keeping things real and true rather than "jumping onto the spirituality bandwagon", grabbing onto the newest label or giving something a fancy name to resell it. At HBH we enjoy utilizing, honoring and giving back for all the gifts we receive from the Earth. We embrace focusing on renewing and nurturing life for all life. Whether you are just beginning your journey or have been at "it" for years, we have offerings that can fit into your life to assist you as you make your way. Heron Brook Haven is a bridge between the past and the future, the physical world and the Spirit World, the modern world and the Ancient Ways. It is in being that bridge that we are co-creating a brighter world for us, future generations and all beings! As we make our way through the journey of life, it is up to each of us to find our way through the experiences we are handed. No one person or experience is any more, or any less, important than any other. Many tend to deal with the experiences through various "coping skills" that tend to be habits, learned behaviors or ingrained ways. Most of these go against our true nature and way of being. One can tend to disconnect from their body or seek quick fixes for what hurts, whether it be physical or internal. To heal and be whole we must walk through these experiences. However one doesn't have to make that journey alone. Heron Brook Haven is a place where you are supported and guided through these life transitions. We help you reconnect to your Source, your truth, your experience, and transmute it into a positive stepping stone that propels you forward. We offer several modalities, tools and natural ways to support this process. Heron Brook Haven is a place where you can find the time and space to reconnect. Whether you are seeking healing, ceremony, connecting with nature, training or experiences to further your growth, Heron Brook Haven offers several options for this and more. Earth-based Medicine is at the core of all we offer and do. We are often asked what Earth-based means. It has several aspects and at Heron Brook Haven we honor them all! Medicine, in the way we see things, is more than a pill or procedure, although that can be part of it. Medicine is anything that can help you in any way along your journey. This incorporates everything. It includes our animal and plant friends, our dreams, natural remedies, and even what we carry within us. The aspects that the Natural World represent, symbolize and teach is another piece to Earth-based Medicine. This can be the lessons of the Wheel, the symbolism and integration of the natural cycles we all go through, and more!! Lastly, maybe most important, Earth-based Medicine involves coming to peace with and understanding that we are Spirit first. We are here to live, let life live with and through us, and have these amazing experiences of all kinds. This is something many struggle with without knowing it. While we are here, we are Earth-based. It is important for each of us to bring the physical and Spirit aspects together within our own being. Everything that happens to us, whether it is an illness, an accident, a job promotion, something we are born with or any of the experiences being human offers, has its roots in the Spirit World. It is up to us here on Earth to make the most of them. Heron Brook Haven helps you accomplish that. We look forward to sharing the journey with all those who find their way to us. Heron Brook Haven has exciting plans, ideas and goals. We are very excited for what lies ahead, for us and for the world! We look forward to the growth along with all that enables us to bring you. For each one we help heal and find their way, we are helping create the brighter future we are all seeking. We will continue to be led and supported along the path that is meant for us. We believe it is in coming together and sharing our experiences, our stories and our dreams, that we will create the greatest changes. As with any being, the energies, teachings and gifts they offer are many. As mankind makes the way through our unfolding journey the medicine, power and essence of the Blue Heron becomes increasingly important. What is spoke of here is only part of what they have to offer us. It is in accepting these gifts that we can learn the whole of who we are and the deeper lessons the Great Blue can offer. We can all feel gangly and awkward as we begin to transition and discover our truths, just as the Heron appears when it begins to take off. Relying on our instincts, our self and our faith we can reach the plateau where we are flying. A Heron in flight is serene, graceful, beautiful and a journey of ease and peace. This is something we are all entitled to and have the ability to achieve. To achieve this requires effort and honest self reflection. If we are willing to stand in the waters of our life, dive deep when needed and trust in our abilities, we will be rewarded. Herons tend to be solo beings. They also know when it is time to come together. There is always a time when it is important to seek out the comfort, assistance and blessings of others. When they come together it is a joint effort. 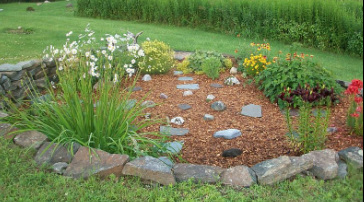 Both the male and the female work together to create a space of harmony and growth. We can learn to create this type of space within our own being. Learning to allow the aspects within us to mingle and work together, rather than fight each other, we can bring our self to a place of Oneness. It is then we can stand in who we are. We can walk with and be at one with what is within us, rather than fight it and have it create dis-ease and illness in our life. A Blue Heron at peace, standing on its own in the stillness of who and what it is, is a magical sight! Being at peace within yourself is a key to maintaining your balance and peace within a shifting, changing world. We all have issues and things we are given in this life to make our way through. We all come through with things from the past that have an affect on the life we are living now. One of the greatest gifts of the Heron is that they guide us through those places of confusion and pain. They assist us in rising up from the ashes of what has been and aid us in flying into what will be. The reward is YOU, at peace and able to BE! 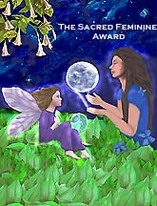 We are honored to be a recipient of the Sacred Feminine Award which is given to websites that promote Universal Healing, Love, and Peace.